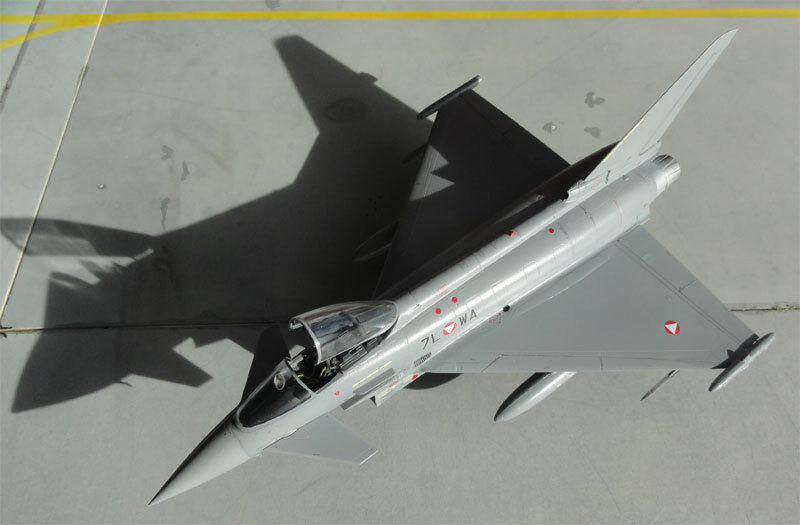 The Eurofighter EF2000, named the Typhoon by the RAF, is an advanced multi-role combat aircraft with an impressive manoeuvrability for the air superiority role. 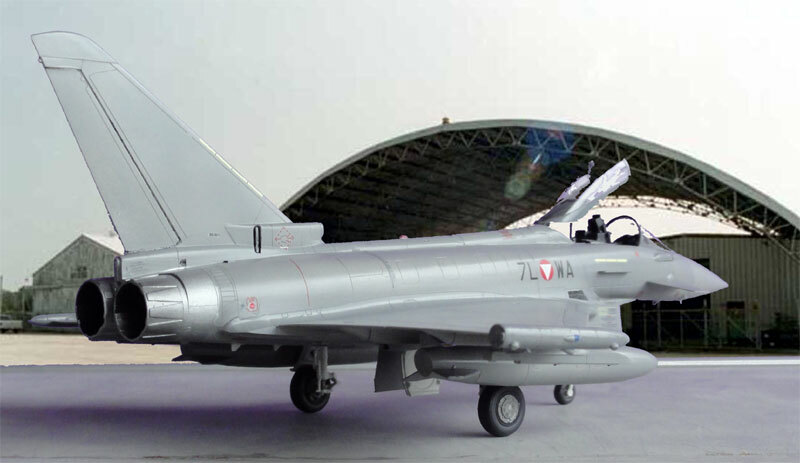 Equipped with the latest generation of guided missiles, the Eurofighter can deploy several advanced weapons. 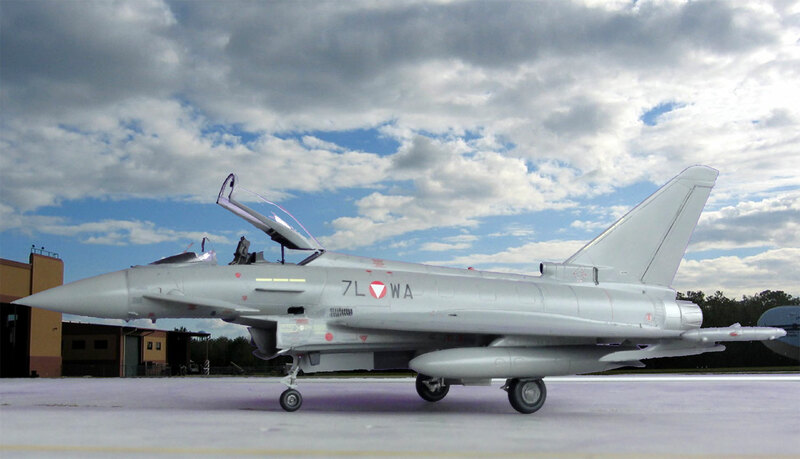 It has a top speed of Mach 2.0+ with 2 Eurojet EJ200 engines with afterburner (90 kN each). 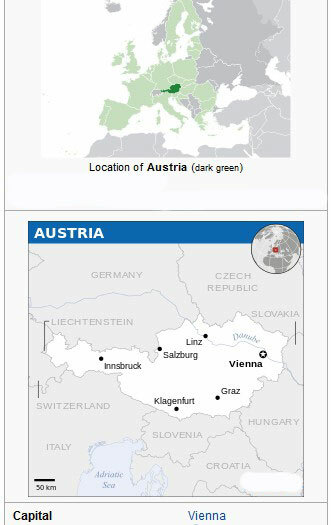 Deliveries began at the end of 2003 and hundreds of aircraft are in service with the German Luftwaffe, British RAF, Italia, Spain, Saudie Arabia and ... Austria. 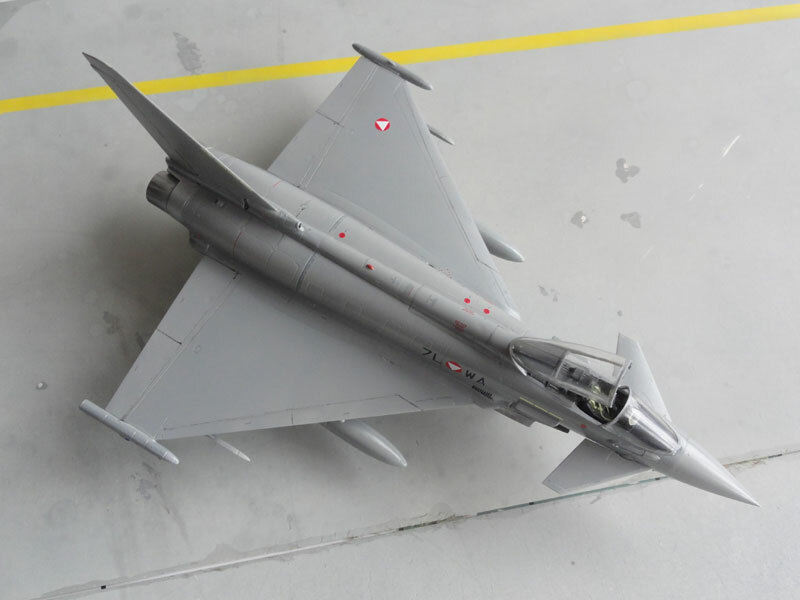 Read "why Austria selected the EF2000..."
The Revell kit 04317 dates from 2007 and is very good. 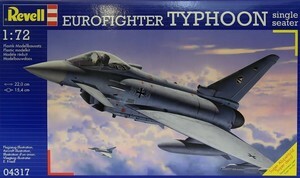 It has fine engraved panellines and captures the complex looks of the real Typhoon very well. 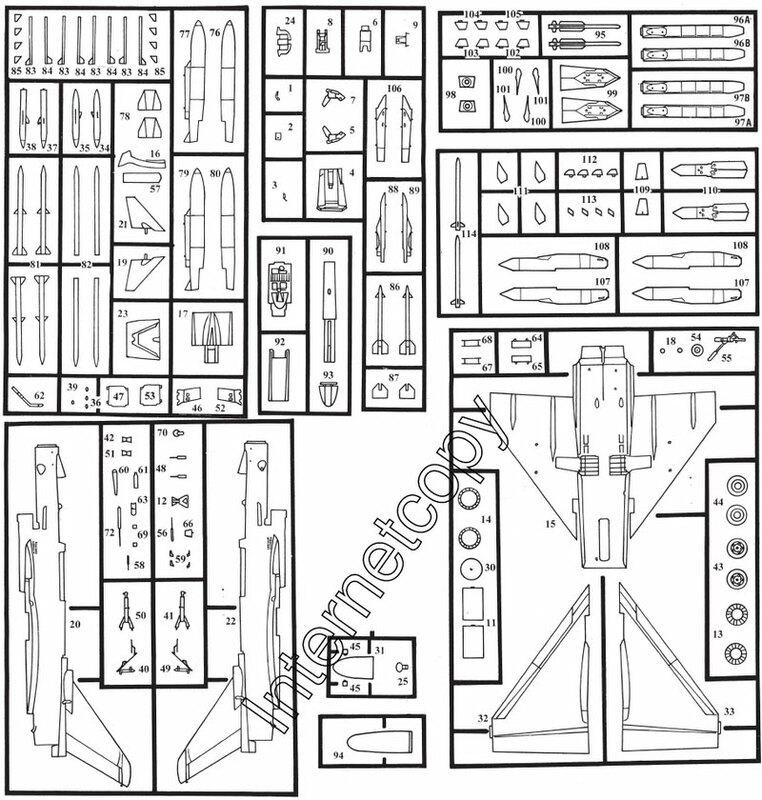 It also has quite some stores in the kit like two external wing tanks, 4 Meteor missiles, 4 AMRAAM missiles, 2 Sidewinder missiles, 2 IRIS-T missiles, 2 Taurus Missiles and 2 Storm Shadow missiles. There are a couple of hundred parts, including many for the stores. 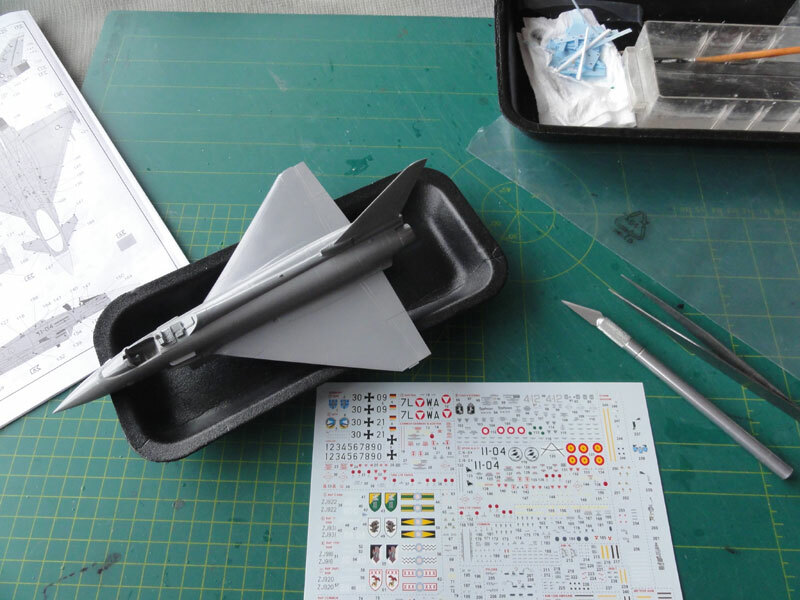 Construction of the kit is rather straight forward. The Martin Baker Mk.16A seat is well detailed with several parts. Some harness straps from tape were only added. In STEP 4 the decals are wrongly numbered. Decalnumber is not 253 but 257 and 255 is 259, 259 should be 260, 257 should be 261. Decal 258 is not shown. The result is a nice instruments and cockpit look with the tub. Seat will be fitted at the last stage. 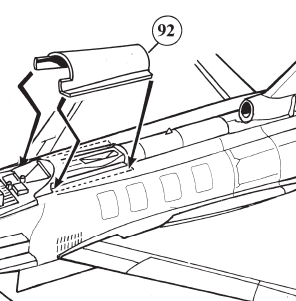 In the instructions sheet STEP 6, the canards were not fitted to prevent damage. 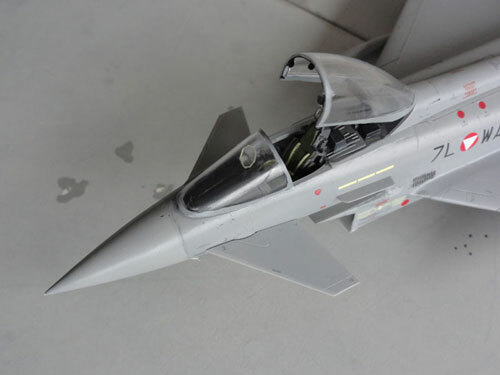 Although there is an intake trunk to be painted white, the engine fan faces can be seen but are missing. A couple were retrieved from the spares box and fitted inside. There is a choice for open or closed afterburner cans and the exhaust pipes are deep. Well done. 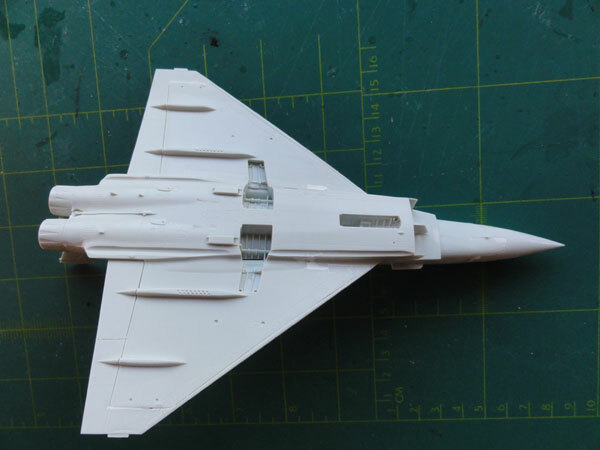 Wing fitting in STEP 10 requires carefull alignment and some putty and sanding. The long junction needs some some as well as getting the intake area smooth. But nothing very difficult though. The fit of the upper airbrake fairing #90 in STEP 14 and the airbrake itself (part #92 and seen in STEP 25) requires filler and sanding. Better to pick the closed airbrake option and sand everything smooth. The airbrake outlines were than inscribed with an OLFA p-cutter. 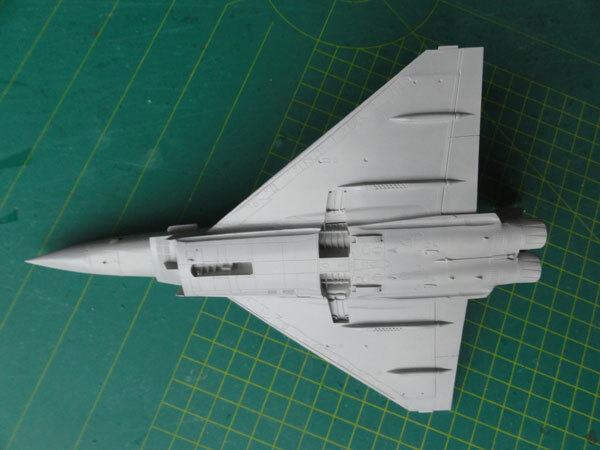 The undercarriage was fitted after painting the main model. It is well detailed. So skip STEPs 16-20 for now. In STEP 21 the nose sensor fairing is not applicable for all versions. 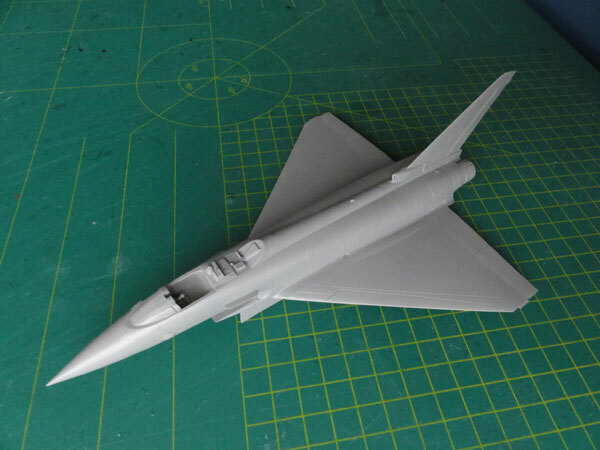 The canopy will be fitted later and can be set open, Revell suggests how this can be done. I settled with some metal pins for strength at the back op the canopy. 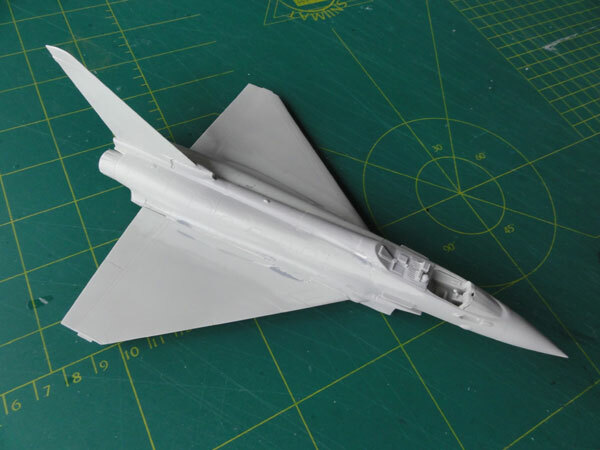 The overall model being now assembled shows a very nice model of the Eurofighter. Now it was time to assemble the desired stores which are good. Depending on the scheme picked, select which ones are desired. First a base coat of grey was airbrushed with the Harder Steenbeck airbrush to check for any flaws. Corrrections with minor amounts of putty were done. 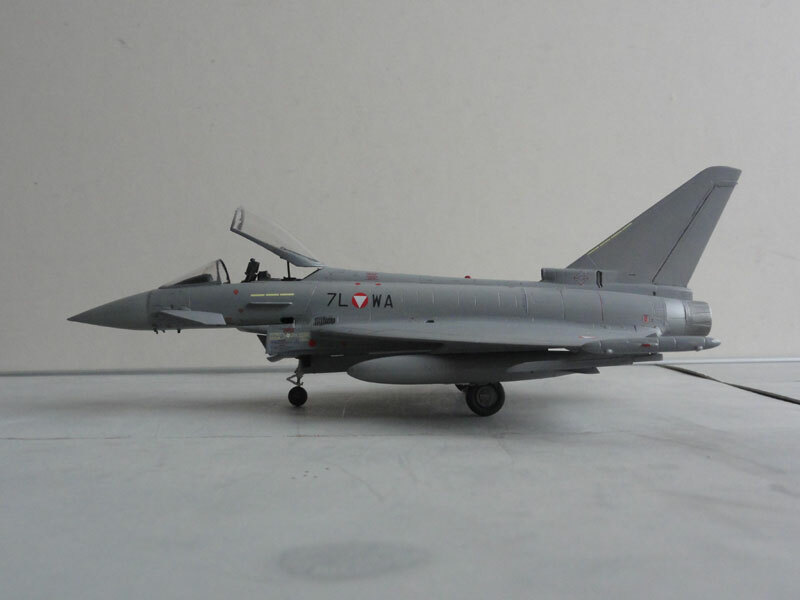 It was decided to pick the AUSTRIA air force scheme for the EF2000, of aircraft code 7L-WA (cn 133/AS001). 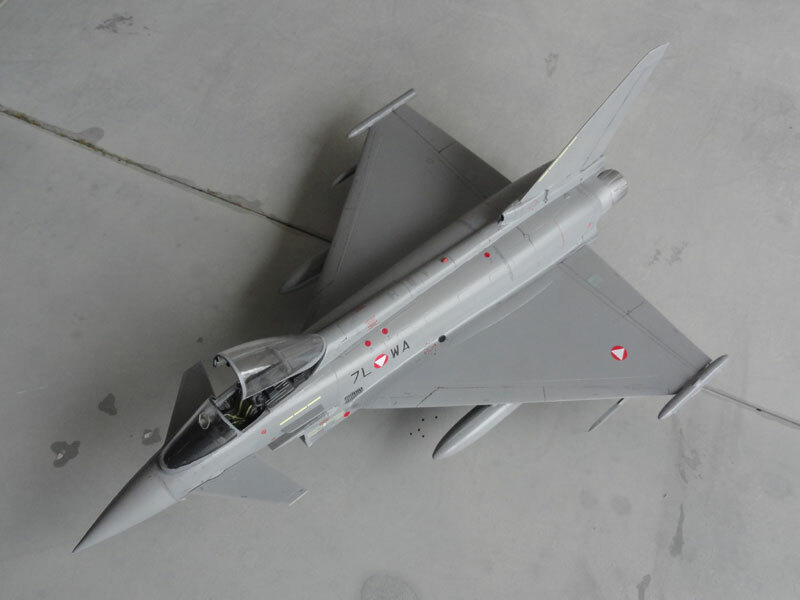 For the Austrian Eurofighter the grey coat selected with GUNZE SANGYO 337 acrylic, which is FS35237. Some areas like the radar nose, leading edges and on the intake have a lighter "flint grey" or Barley shade. I used there GUNZE 306. This was masked off with low tack masking tape and airbrushed. 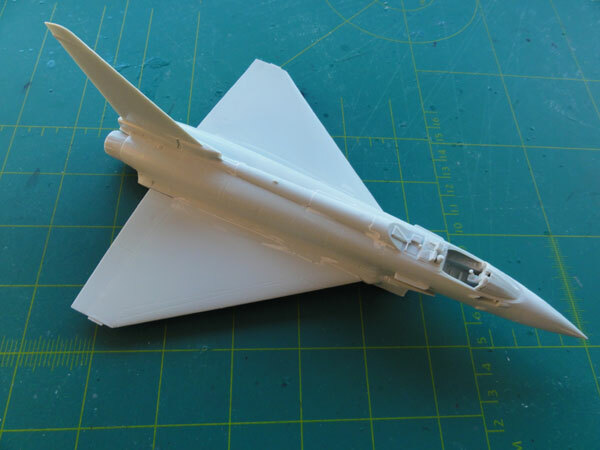 Than, the Eurofighter model got a gloss coat to allow decal application preventing "silvering". (That is to prevent tiny air bubbles that settle below the decal and look bad on a model) using this method.... And with the airbrush, a gloss coat of Johnson Future thinned with 40% "ketonatus" alkohol was thus first airbrushed. 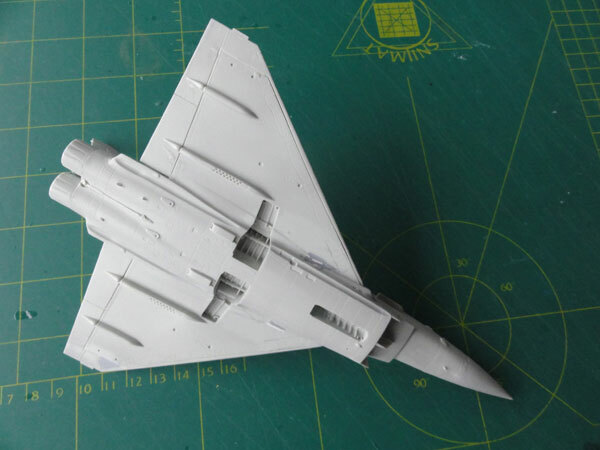 Time for the decals, which have lots of stencilling, very nice, but it take quite some time to apply to the model. About 3 hours it took. 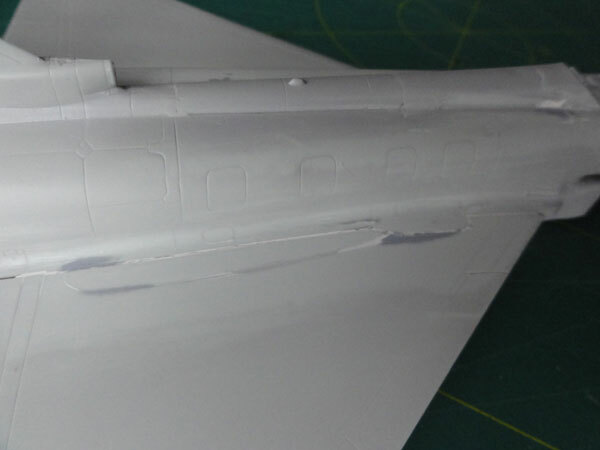 Next after drying time, the undercarriage was fitted as seen in STEPS 16-20. It needs some work and the gears were painted and very light grey. Also two fuel tanks were added with their pylons. 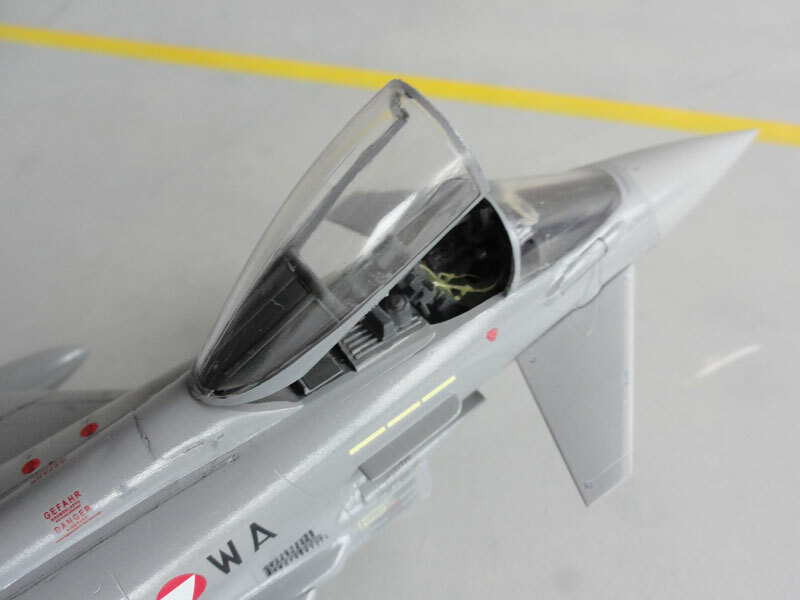 A very light wash was applied using PROMODELLER with a tiny airbrush, such as the fuselage grills near the wing junction, the APU exhaust midwing-junction and the flaps and slat. Anti-collision lights were tipped with paint and Microscale Kristal Kleer. The model now got a protective coat with the airbrush also making it a bit duller with a semi-gloss coat of Johnson Future, thinned with 40% Alkohol with about 10% Tamiya X21 flatbase matting agent. 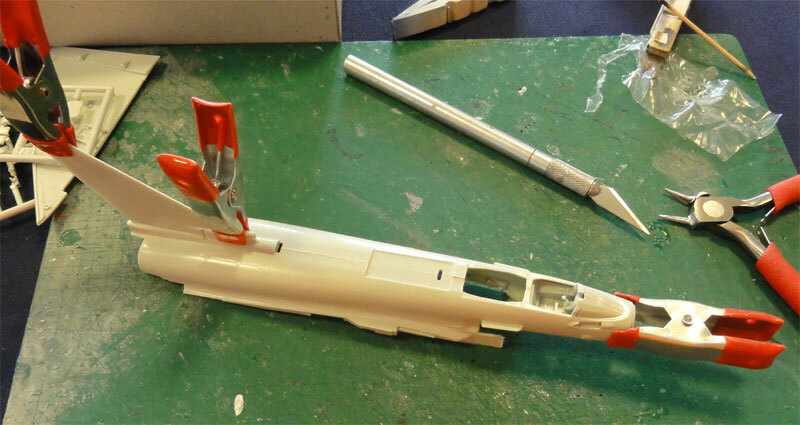 Now the other fragile parts can be fitted, like the small pitot tubes and sensors as seen in STEP 26. The canopy frame was painted also on the inside. 3 small mirrors and 2 handles were fitted on the inside frame from scrap plastic. Canards were set and seat was installed followed by the canopy. That completed the model. 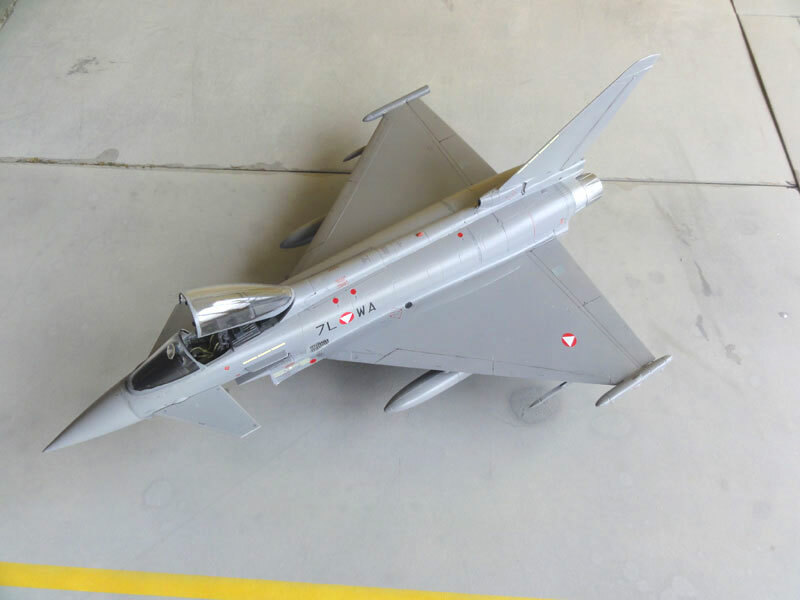 The Austrian government agreed July 2003 to buy the Eurofighter Typhoon of the "tranche 2" and it included training, logistics, maintenance, and a simulator. The first aircraft of 15 aircraft ordered was delivered on July 2007 and they mostly fly from Zeltweg, Austria.